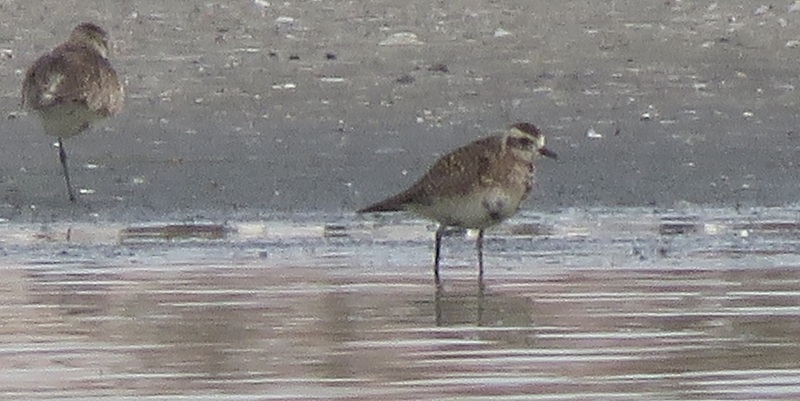 Quick note to report Senegal’s 12th and 13th American Golden Plovers, a species that is now near-annual here but which always remains a good find. After spotting what looked like a suspicious Pluvialis plover (= anything but a Grey Plover), based on the fairly contrasted plumage, seemingly long-bodied and long-legged appearance combined with a small-ish bill, we had to wait a while, gradually approaching the lake’s edge, before we could confirm that it was indeed a “Lesser” Golden Plover (= American or Pacific GP). The important primary projection with wing tips reaching well beyond the tail, bronzy rump and lower back, dark-capped head with distinctive pale supercilium and forehead, and most significantly at one point the bird stretched its wings upwards which allowed us to see the grey underwing. 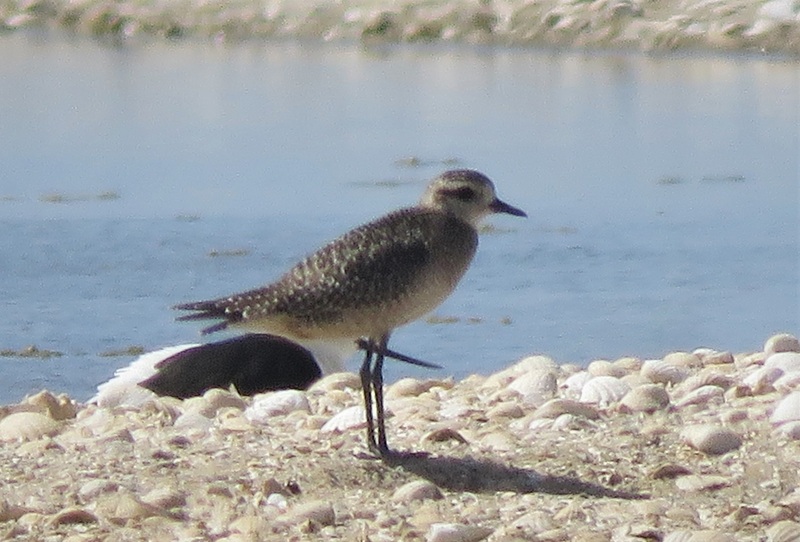 Everything else about the bird was pretty standard for a first-year American Golden Plover. Bingo! To get a sense of the potential of lac Mbeubeusse for waders and other waterbirds, check out our eBird checklist: other good birds here included hundreds of Northern Shovelers and many Garganeys, Ruffs, Little Stints and Common Ringed Plovers, several Curlew Sandpipers and Dunlins, quite a few Audouin’s Gulls, a few terns including all three species of Chlidonias marsh terns, 124 Greater Flamingos, at least one Red-rumped Swallow, etc. etc. All this with Dakar’s giant rubbish tip as a backdrop, spewing black smoke and gradually covering the niaye in a thick layer of waste on its western edge… quite a sad contrast with all the bird life. And definitely not the most idyllic birding hotspot! 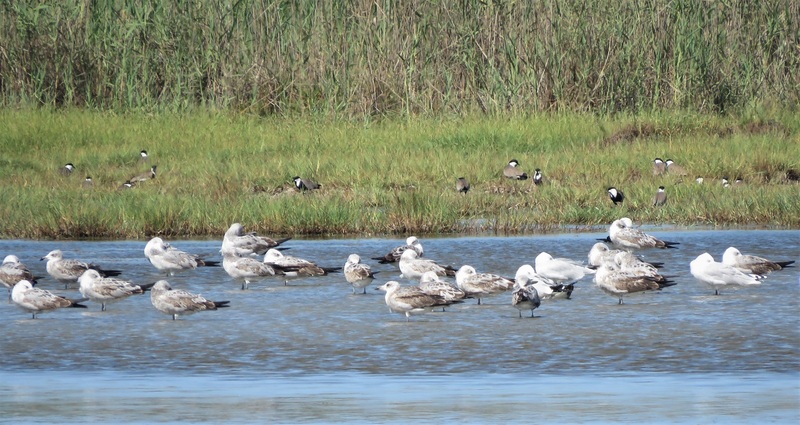 Number 13 was found by Mark Finn barely a week later, on Friday Nov. 9th, at one of the lagoons near Pointe Sarène, south of Mbour. 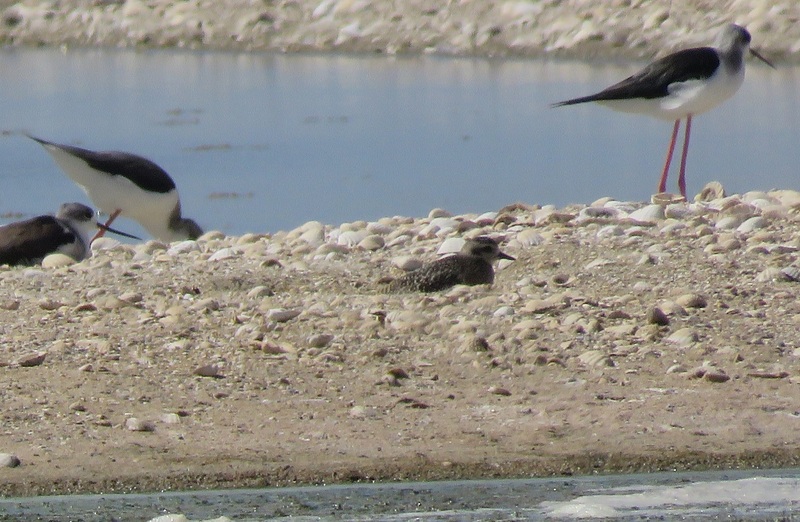 As I happened to spend the weekend at nearby Nianing and was planning on visiting Sarène anyway, I went there the following day and easily located the bird, an adult moulting into winter plumage. 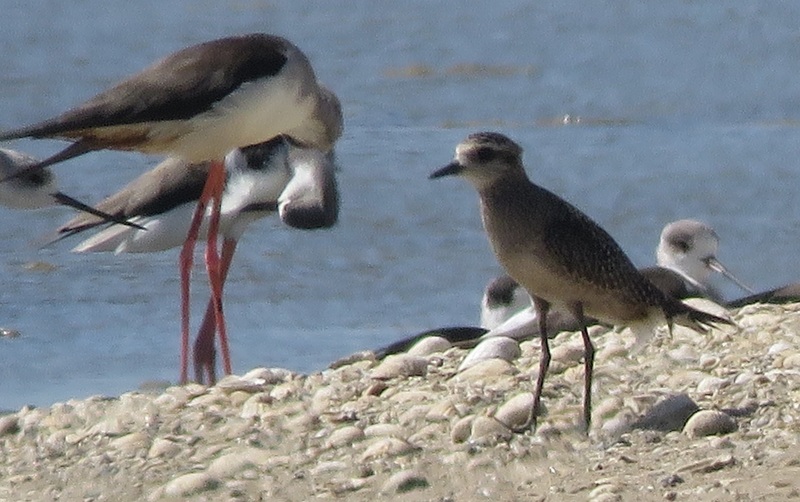 Unlike the previous bird, it was actively feeding on the shores of a seasonal pond surrounded by pastures and fields, along with several other waders including Ruff, Redshank, Greenshank, Redshank. Wood Sandpiper, Green Sandpiper, Marsh Sandpiper, Turnstone, Common Sandpiper, and Common Snipe. 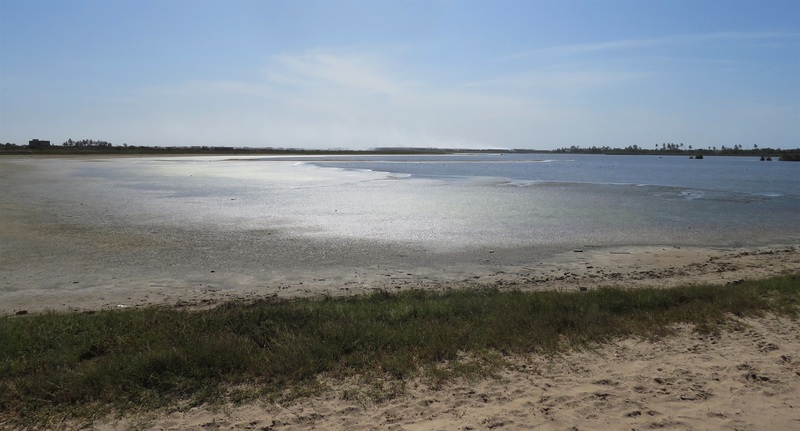 This appears to be the first record along the Petite Côte south of Dakar, at a site that has great potential for shorebirds and other migrants: around Nianing, Sarène and Mbodiène are several seasonal lakes that fill up during the rains, as well as coastal saltwater (or brackish) lagoons as can be seen on the map below. The marker shows where the AGP was feeding on Saturday. Despite being a bit distant I managed some decent record shots of the bird, but unfortunately my camera was stolen later in the weekend… so these pictures are lost forever to humanity. Not that I would have won any prizes with them. So no more blurred pictures from the field on this blog for a little while. 8 April 2018: an adult or 2nd c.y. at Technopole (BP) – photos above and more info here. Out of these 12 records, eight are from Dakar (mostly Technopole of course! ), just one from the north – the first country record, in 1979 – and two are from Basse-Casamance where the species may well winter, at least occasionally. And six of these records are from just the past four years: one in 2015, four birds in 2017, and now already three birds this year. American Golden Plovers tend to mainly show up in spring (April-May) and in autumn (Oct.-Nov.) as shown in this little chart below; it’s also in spring that they linger the longest: in spring 2017, Technopole saw a continued presence during five weeks, involving at least four different birds. Note that birds that stayed for several days across two months are counted in both months.